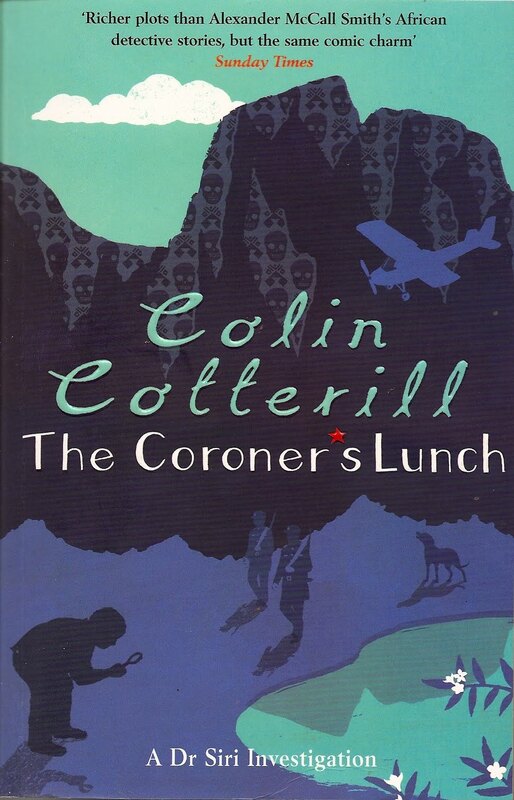 The Coroner's Lunch, by Colin Cotterill, is one of those books that makes me feel better about my TBR pile. I've had it for a few years now and only just got around to reading it, mainly because I felt guilty at hardly reading anything from my own shelves in 2014. But it waited patiently for me to finally get around to it, and then it validated the space it takes up on my shelf by being just fantastic. Hooray! The Coroner's Lunch introduces us to Dr. Siri, a 72-year-old coroner in Laos around 1970, just as the country adjusts to Communist rule. As coroner, Siri must write cause of death for many cadavers, and some of the people who come to him do not seem to have died natural deaths. Even when he is heavily advised against doing so, Siri investigates those deaths. Sometimes he is helped along by the spirit world; though he is a very logical and pragmatic man, Dr. Siri often sees the spirits of the dead, and they will often guide his research and methods. I was a little skeptical when I first encountered the spirits in The Coroner's Lunch, mostly because I didn't really like a somewhat similar theme in Maisie Dobbs. But it was very believable here and works seamlessly into the story as a whole. Dr. Siri has a lot of demons and guilt, and in many ways, the spirits are just manifestations of those occurrences in his past. But in other ways, the spirit world is alive and well and a very strong theme in this story, so if that puts you off, you may want to steer clear. For my part, I loved the angle that brought to this book, especially when weighed against Siri's own skepticism. It added a new, unique dimension to the whole thing. I also really appreciated the setting. I don't know of many books set in Laos (do you?). I liked that it was set in the 1970s, just after the Communist revolution as the country was on the cusp of modernity but still quite rural. For example, Siri first used a telephone at age 72. But he also goes to a rural area and sees massive deforestation, so clearly the modern world, with its benefits and horrors, hasn't left Laos behind. The secondary characters are all wonderful, too. I particularly liked Thuy, Dr. Siri's very capable female assistant who also enjoys reading comic books. And Siri himself is absolutely charming. I really enjoy books with older protagonists, and Dr. Siri is like a Miss Marple who has decided that she doesn't care who she pisses off, she's just going to go do her thing and be a boss. To clarify, Miss Marple totally IS a boss, but she hides it very well behind her politeness and gentle kindness. Dr. Siri, like the honey badger, doesn't care who he offends because he's old and tired and just wants to solve crime and get on with it. He's fantastic. The author of the Dr. Siri series is Colin Cotterill, a British expat living in Southeast Asia. I suspect Cotterill has the dry sense of humor the Brits are famous for, and he has infused Dr. Siri with that humor as well (though maybe the Lao are more witty and dry than I give them credit for - I don't know much about their humor). In my head, I imagined Dr. Siri to be very similar to Bill Nighy in Worricker, except not British. This was probably helped along by the audiobook narrator, Clive Chafer, who was absolutely excellent but extremely English. I thoroughly enjoyed this novel, and I'm so glad that someone (I don't remember who it was!) recommended it to me in a comment on this blog or in response to a comment I made elsewhere. This is exactly the sort of mystery I love, that deals with not just the mystery at hand, but with so many other things as well, with characters with whom I can't wait to spend more time. I am so happy to hear that this is a good series. I think that someone mentioned it in my book group or maybe it was another series that this author writes. Anyway, it's on my list and glad to know that it works well in audio too. Thanks for the info!! Dr. Siri books have always interested me. I don't normally read mysteries, but when they are set in a far off location I'm often more drawn to them. I gather this is the first in the series, and that seems like the best place to start! Love the cover! I got into reading Golden Age mysteries a year ago but largely I don't delve into the mystery genre much. That said, this does sound really interesting for the historical and geographical setting. Isn't Siri great? I really liked this one when I read it. I read the first book of Cotterill's other series (Jimm Juree) and was on the fence about it but this sounds like it's worth trying. Have you read the Vish Puri mysteries by Tarquin Hall? Dr. Siri is my favorite! I think I especially loved his indifference to protocol--he's living in a Communist regime, but he's a loyal communist, so the kind of environment that generally creates one kind of tension is totally different here--the bureaucracy is annoying, but it's HIS team. And it's so interesting to watch Laos change over the next few years as the series continues. I think/hope I recommended it to you--it's one of those ones I push into everyone's hands. I'm really glad you loved it!